North Memorial Health, located in Robbinsdale, Minn., consisting of 27 specialty and primary care clinics, as well as two hospitals in the Twin Cities area, is a progressive leader in Minnesota’s healthcare system. Early in 2014, North Memorial was in search of a cutting-edge technology that would help to differentiate the organization from others of its kind in the metro area. At a time where digital transformation was becoming ubiquitous across all industries, healthcare was certainly no exception to such new technological innovations changing the way in which patients now interact with providers. At the dawn of the new digital era of healthcare communication, North Memorial desired a new solution that would meet the changing communications needs of its patients: a chat/text scheduling platform. As technology only continued to have a significant impact on healthcare as an industry, it became important to North Memorial Health as a leading organization to have the ability to communicate with patients in a way that is convenient and easy for them. With digital transformation as the key to a successful future of healthcare in mind, the organization’s President of Population Health knew that cutting-edge unified communications technology was the next step for the health system. Knowing that a text or chat to schedule platform must be secure and in compliance with HIPAA regulations, the organization began the search for a secure unified communications solution. Specifically, it was important to North Memorial Health that their communications solution would allow call center agents to both quickly and effectively switch from a chat or text conversation to audio (a multimedia solution) in cases where such an escalation would be necessary. 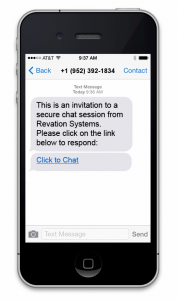 In June of 2015, North Memorial Health began working with Revation Systems, a leader in secure unified communications specializing in the healthcare vertical, to implement a chat/text to schedule platform across their clinics. Revation’s LinkLive Healthcare solution provides the healthcare organization with secure, HIPAA-compliant unified communications that has enabled North to deploy a chat/text to schedule platform across all 27 of their clinics along with both hospitals. In addition to using LinkLive Healthcare to enhance and improve the scheduling process and patient-provider communications, North Memorial Health has deployed Revation’s LinkLive Knowledge Base solution in their call center. Knowledge Base, fully integrated with Revation’s LinkLive multimedia contact center solution, provides call center agents with instant access to information through a robust search function, dramatically increasing agent productivity while simultaneously improving patient experience. The solution can be updated by each individual department or clinic and has enabled North Memorial’s agents to easily and quickly reference provider protocol outside of their scheduling software, resulting in improved communications with patients. After implementing Revation’s LinkLive cloud-based multimedia call center solution, North Memorial Health has experienced significant improvements in their revenue cycle. The organization saw an uptick in appointments made and kept – 6%, to be exact. In the first month using LinkLive for text/chat to schedule appointments, North Memorial had 422 inbound chats or texts for appointment scheduling, with 90% resulting in a scheduled appointment. Out of the 422 chats or texts, there was only 1 case in which the conversation was escalated to an audio phone call. North Memorial’s goal was to decrease call volume while simultaneously increasing number of visits and Revation’s LinkLive delivered. The additional multimedia channels that LinkLive Healthcare provides has given patients/customers additional modes in which to communicate through to receive the care they need when they need it most. North Memorial Health is located in Robbinsdale, Minnesota and has 27 specialty and primary care clinics, home care offerings, medical transportation services, and two hospitals – North Memorial Health Hospital and Maple Grove Hospital. With over 450 care providers and 5,000 team members, North Memorial is a leading care provider in the Twin Cities metro area of Minneapolis/St. Paul. With the mission of empowering patients to achieve their best health, the healthcare organization seeks to engage and inform patients to encourage healthier and better lives.